OK, this is the literal beginning of the end! Check the last preview at the Dark Horse site, here! And let me quickly note a couple of things while I have the chance, here. First, even though we're at the end, it's never too late to climb on board the series — you can find all the Knights of the Old Republic trade paperbacks on Amazon and at your local retailer. Second, I was very sorry to read about Wizards of the Coast bringing an end its license for the Star Wars Role-Playing Game and the Miniatures game later this year. It was a real kick getting to see some of our characters as miniatures, and the Knights of the Old Republic Campaign Guide was a blast to work on. Copies of that book are pretty dear and growing more so, as you might tell from the Amazon link; I do have a very small quantity of copies that I auction occasionally, so I'll try to alert readers here when they go online. I wish the best to everyone involved in that line — again, it was a terrific experience and a great product to have out there. And the long-awaited sequel to Mass Effect releases today! You've seen the commercial on the NFC game — and you've (hopefully) read the first issue of Mass Effect Redemption. Now's the time to snag your copy of the game and head on back to read the rest of the comics series! Now, where's that UPS guy...? Update: And MTV has an interview with Mass Effect 2's project director, about the parallel storylines between the comics and the game. Del Rey has announced that the third of my Lost Tribe of the Sith e-books will be available for download on February 10. Paragon revisits the crew of shipwrecked Omen at a critical moment, fifteen years into their exile. Not all is well with the Sith — but then, when is it ever? The full preview copy is here. The e-book contains a preview of the fourth Fate of the Jedi novel, Backlash by Aaron Allston. Check back here for the download locations when it goes live. The series remains one of the top SF downloads on Amazon's kindle (snag the earlier chapters here and here). Knights of the Old Republic #49 — The Penultimate — ships! Forty-nine down, one to go! 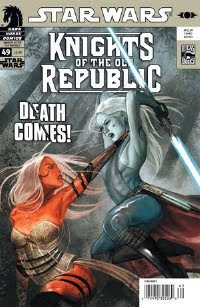 Wednesday sees the release of Knights of the Old Republic #49, showcasing the sense-shattering showdown between Jarael and Chantique! • The secret to Zayne's relationship with the Force! • The final fate of The Crucible! • What "Masks" didn't tell you about Revan! ... and more! All this and Cassus Fett! Thoughts on the issue coming in a few days, but in the meantime, enjoy! And for April, Dark Horse has solicited Mass Effect: Redemption #4, with my script based on a Mac Walters story; a page has been started here on the site for it. Check out the Daryl Mandrayk cover, featuring Miranda from Mass Effect 2! Star Wars: Knights of the Old Republic: Commencement has just been added to the iTunes store at a promotional introductory price of $1.99. Be sure to check it out! Over the weekend, I was informed that Jarael from the Star Wars: Knights of the Old Republic comics series was named "Miss Star Wars 2009" by the fans at Wookieepedia, beating out Mara Jade and Aayla Secura, among others. It's evidently the fifth year for one of these selections. Jarael thanks the judges and credits the win to her speech about wanting to achieve world peace by whacking people up side the head with big electrically charged battle staffs!